Today, the Morgan Silver Dollar Coin remembers a day of excitement on the New York Stock Exchange on January 23, 1899. Wild Speculation in the Early Transactions — Booms in Railroad Shares. New York, Jan. 23. The stock market opened in a perfect hurly burly of excitement. Prices covered a range of several points In many instances, advancing and declining with equal violence. Pennsylvania Railroad rose over five points, and Pan Handle, after a rise of over 11 percent broke rapidly eight points. Canada Southern rose over four points. General Electric advanced nearly four points. The wildness of the market continued without abatement. After the early transactions irregularity was general. Government bonds unchanged. No such extraordinary movements in prices have been witnessed in years as was shown in the dealings of the first thirty minutes. The grangers were comparatively dull. Illinois Central was a strong feature of the higher priced stocks. The industrials shares underwent the irregular movements. The wild movements that took place in various quarters of the market, plainly served to unsettle speculative confidence, and the whole market was weakened by 11 o’clock. The London market for American stocks was reported active and excited. At noon the stock market was heavy, prices being down by from fractions to 2 percent and over. After a Most Buoyant Opening Stocks Became Quieter. Standard Shares Took Lead in the Early Advance. Special Dispatch to The Evening Star. NEW YORK. January 23. One of the most excited openings in the history of the New York stock market was recorded at the beginning of business this morning, and new high prices were recorded in nearly all departments. Brokers found it impossible to execute many of the orders tendered, and notices of the execution of order were in many cases so delayed that board room reports failed to correspond with the tape. This discrepancy in some instances extended to 3 and 4 points. Realizing sales at the advance forced a sharp reaction in the specialties during the opening hour. Panhandle, Canada Southern and the issues specifically printed out in the speculative forecasts of the Sunday papers were widest in their fluctuations. The first named property, after asharp rise, declined 16 percent during the forenoon. The total trading in all issues up to noon was something over 800,000 shares, a record-breaking achievement. The standard stocks did better than many of their friends had predicted for them under such an exciting period. Two and three percent declines were not unusual, but in many instances these declines were only temporary. New York Central, Pennsylvania railroad, Northwest and the granger list generally showed remarkable recuperative power. Manhattan was inclined to some irregularity. but was well bought at the decline. Brooklyn Rapid Transit sold down 5 percent, but was given excellent support later in the day. Atchison preferred and the Pacific issues were all in good demand, not withstanding heavy profit-taking in all of them. During the more rational trading of the afternoon the coal stocks came prominently to the front as factors. In nearly all of the anthracite roads there were evidences of exceptionally confident buying. The better understanding now existing between rival corporations gives promise of working to the greater good of all concerned. Reading issues, Delaware and Hudson and Ontario and Western were active under a good demand credited to inside sources. The gigantic proportions of the present speculation has overthrown all the old theories relative to the logical trend of events. The only certain ending to such a market now seems probable only through the medium of an accident. Cheap money and prosperity in all branches of trade have given an unprecedented breadth to the stock market. Reactions come and go and the sellers of one hour are the buyers of the next. The process may go on indefinitely, but caution cannot fail of good results from now on. 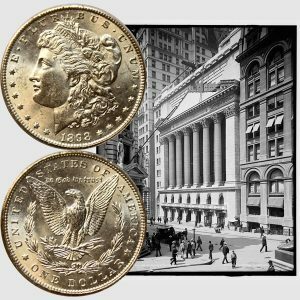 The Morgan Silver Dollar Coin shows with an image of the New York Stock Exchange building, circa 1900.